Sold by F-Begonia and Fulfilled by Amazon. Gift-wrap available. Smart Wi-Fi Touch Wall Switch: This 1 Gang 1 Way touch switch supports maximum power of 400W that can work with most lights and other electric appliances. 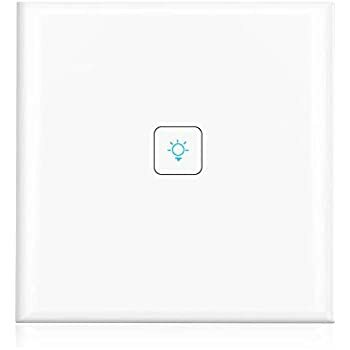 Size: 3.4(L)*3.4(W)*1.3(H) inch, AC 90-250V voltage.Note: It needs to connect to neutral line to work(Usuall only fit for New house electricy Circuit， hardly fit for old house circuit). 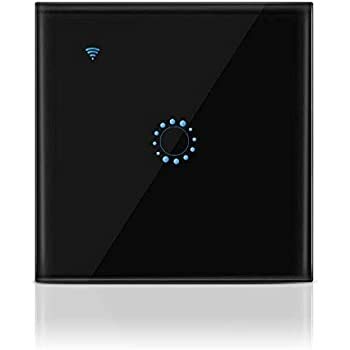 APP Remote Control: User can use a smartphone to remotely control turn on / off home electronics at anytime and anywhere via APP as long as the phone has 2G/3G/4G/WIFI network. It makes your home appliances smart in 1 second. Compatible with iOS 6.0 or above, Android 2.3 or above. APP download: eWeLink. Premium Quality: Made of flame-resistant ABS shell and toughened glass panel that ensures a good durability. Luxury and fashion design that can be well fit into most houses with different decorate style. 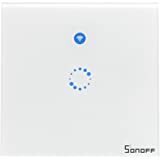 More Intelligent: Work with Amazon Alexa / Google Home, user can control this WiFi socket via voice through Alexa / Google device that makes the operation more convenient and more intelligent. 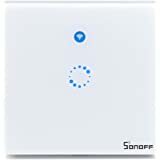 Strong Function: Support timer function that includes countdown, single, repeat, delay and loop timer, it can set Max. 8 groups of timer setting. Support multi-player control, one switch can be controlled by multi phones (by share function) and one phone can control several switch. Support network off work function, the timer setting can work as usual even if the network is shutting down. Sold by F-Begonia and sent from Amazon Fulfillment. Sold by sonoff and sent from Amazon Fulfillment. 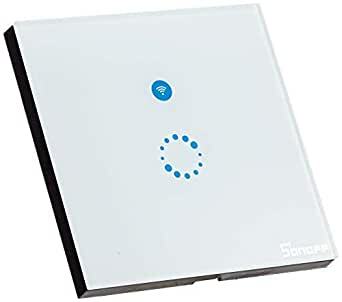 Note: This Wi-Fi touch switch need to connect to a neutral line. 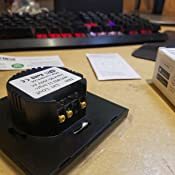 So on the quest for intelligent home light switches we at TRUTH went on a bit of a mission searching high and low for which switches worked and which ones are just plan old Snake oil. 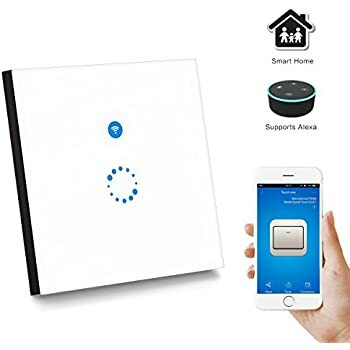 So to Start off we tried the Energenie Network compatible light switches but these didn't work out very well at all and so we stumbled across Sonoff these are Alexa enabled so we thought we would give them a whirl. So to start off if like most households you have standard half inch deep sockets (Worth checking prior to ordering new switches AND BE SURE TO SWITCH POWER OFF PRIOR TO DOING SO EVEN DOING SOMETHING THIS MINOR - BE SAFE) you will need a Single Gang Plate Spacer unfortunately these do cost a few quid each on top of each socket so you have to do this unless you want to do some extensive work to deepen the sockets (which is very messy and I don't advise it). - eWElink App very easy to use great control panel for all lighting very easy to sync new lights to it. - Light Switch Looks great glass front feels great too. - Quite Deep back Back to switch so requires in most cases a Single gang plate added extra cost to upgrade. - If you have the Switch upstair in Bedroom the Bright blue lighting is a little bright and can effect people sleeping. But overall these are truly excellent switches that we will use for most applications but you just have to ensure you have Live and neutral and being in a New Build property we have a Mish-Mash of Live and Neutral, Live and Earth would definitely advise these for anyone with Alexa very easy to setup . Works well, the app is nice and the front plate looks nice, it's such a shame that the connection screws on the back protrude so far and make the unit unsafe. Watch the video to see what I mean. Thees could have been a great item but let down by the app eWELink app. If you look online a lot of people are having trouble with this. It worked great for the first Month or so. Then the lights started to come on and off on their own mainly during the evening and night. 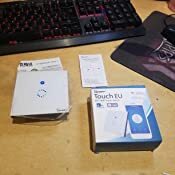 Then I noticed my home network was being attacked and traced it back to the switch and communications with a Chinese IP address. I noticed Data was being mined and sent back to the Chineese IP address. I contacted EWELINK and its developers to complain and suddenly found that the switch stopped connecting to the Network and effectively became useless.I am sure EWELINK are able to disable the switch on their cloud platform based on the switches unique MAC Address. You will never know when your switch will stop working. Its a lot of trouble to Install then Uninstall the switches. Works great. Tip: make sure you disable 5GHz Wi-Fi in your router first then pair through the EWeLink app. The only con is the terminal screws are at the top and kept coming into contact with the top screwhole of the enclosure. I had to bend the top&bottom screwholes flat and use the standard holes to the left&right. The wire screws should be covered or recessed to prevent earthing. Three downsides and two upsides to this product. 1) In the UK, we typically install a switched live. That means we don't typically bring a neutral wire down to the switchplate. 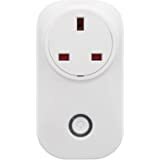 If you want to use this in the UK, you need to rewire your house. I don't know if it's legally acceptable to perform this modification, and would appreciate any feedback. 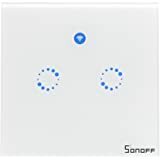 2) There is a circle of light on the front panel around the portion of the plate which you have to touch in order to switch your lights on and off. This circle of light is on when the lights are on and off when the lights are off. Which makes it sodding useless to find the portion of the plat to touch if the lights are off. 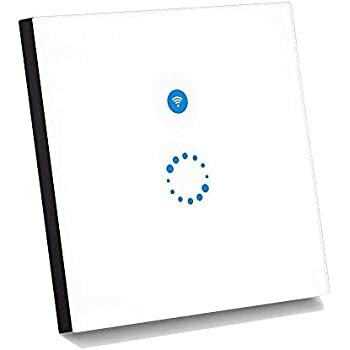 Conversely, there's a blue light which stays on all the time when it's connected to the WiFi. Which is irritating if it's in a bedroom. 3) The faceplate screws need to be very finely adjusted. They need to be sufficiently loose that they don't pull the back of the faceplate so far into the wallbox that the front faceplate can't be clipped on. Unfortunately, when sufficiently loose for this, they also make the front faceplate loose enough to slide down the wall over time. Also, DANGEROUSLY, the front of the switchplate can be rotated and removed without tools. This exposes the connections at the back, including the exposed live connection. 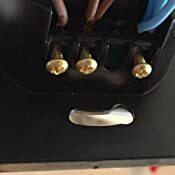 UK switchplates have shrouded connections such that even if you did take the switch plate out of the wallbox, you couldn't touch the live wires with a fat finger. This device have large, exposed, live screws. Again, I'm not even sure this is legal to install in the UK. 1) After installing it, and the app, just follow the on-screen instructions. There are two connection methods. If the first doesn't work, the second will work. Just be patient and be sure you are actually following the instructions. 2) These are hacker's paradise. If you are a software junky and you what to make you own compatible device, the circuit and software are quite freely, and legally, available. 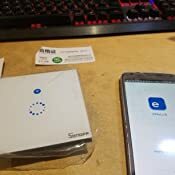 If you don't like eWelink, or don't like the idea of broadcasting your WiFi password over your WiFi to the device, you are free to reprogram it device and install your own client / server solution. I doubt the overall fitness for the UK market. 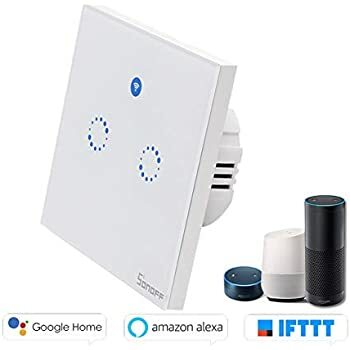 Generally, there's no way to power them, the faceplate connection method is not robust and the internal live connections are easily exposed without tools. I do like that it's so interconnectable. It's a software monkey's dream come true.